Tired of dealing with your old air conditioner that can barely keep your house cool or costs too much to run? If you live in western Wisconsin or northern St. Paul, Minnesota, then consider how you could benefit from a new air conditioner system from Richter Heating & Cooling. You can significantly reduce cooling costs with air conditioners rated up to 25 SEER. Our air conditioning and cooling professionals will make installing your new air conditioning system as easy and affordable as possible. We’ll also haul away and dispose your old air conditioner. At Richter Heating & Cooling, we only install American Standard air conditioners. Why? We could tell you American Standard products are the most dependable in the industry, but it’s so much more believable when others do it for us. Readers of a national product testing and research magazine rated American Standard’s air conditioners as the most reliable brand among leading manufacturers. 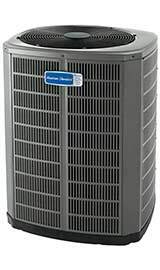 Click here to see the full line of American Standard air conditioners. Contact Richter Heating & Cooling today to learn more about American Standard cooling products or to get a FREE estimate for a new air conditioner. Call 715-557-0583 or complete our online Request FREE Estimate form.